Nintendo of America has joined with the Starlight Starbright Children's Foundation to install hundreds of new Fun Centers in hospitals across North America, helping to boost the spirits of seriously sick children and their families. Nintendo is manfacturing 1250 new Fun Centers, which will feature a Sharp Aquos LCD television, a DVD player, a Wii system and a number of family-friendly games including Super Mario Galaxy, Wii Sports and Mario Party 8. Starlight Starbright says roughly 500 of the Fun Centers should be installed in hospitals by the end of the year. Two of the new units are being presented to the Children's Hospital in Los Angeles as part of a Super Mario Galaxy-themed launch of the new Fun Centers that will feature Discovery Kids star Allen Alvarado along with Mario himself. "We're extremely proud to make Fun Centers a part of our collaboration with Starlight," said Nintendo of America Vice President Don James. "The inclusive fun of Wii is especially valuable for families in need of a tension reliever while dealing with serious pediatric issues. We hope the new Fun Centers will give kids and their loved ones an opportunity to play, laugh and connect with each other amid trying circumstances." "Everyone who has spent time in a hospital knows how scary and lonely it can be," added Starlight CEO Paula Van Ness. "Our Fun Centers transform the hospital experience for children, bringing enjoyment and laughter to an otherwise daunting experience. And as an added benefit of this new Fun Center model, the Wii technology can be used to encourage children to do physical therapy and motion coordination exercises." 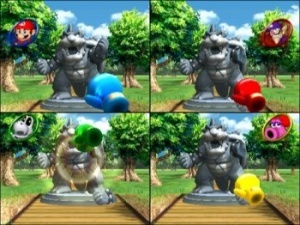 The Wii-based units are the latest version of the Fun Centers, which were first launched in 1992. The previous edition, built around the Nintendo GameCube, has earned praise from families, doctors and hospital employees, and over 5000 of the units have been installed in more than 1000 hospitals across the U.S. and Canada. Many other hospitals remain on a waiting list for the units, however, which cost a total of $4250 to install, administer and support over the life of the hardware. Gamers who would like to express their support for the program can do so by visiting the Site of a Million Stars and placing a star in the Nintendo of America Galaxy. Stars are free and can include messages of support and links to users' favorite websites, and can also be upgraded with special features for tax-deductible donations of $5 to $100. To learn more about the Fun Center program, go to starlight.org/funcenters.